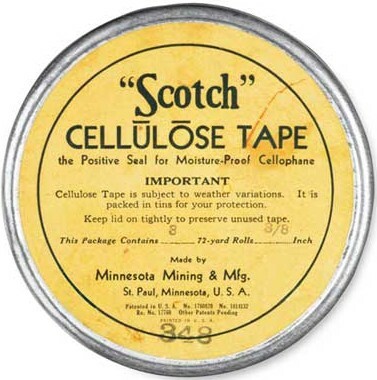 Early 1930s packaging for Scotch brand tape. Richard Drew, a 3M mechanical engineer, designed Scotch Cellulose Tape to give bakers and grocers a quick, waterproof method to seal packages. Until then, water was needed to seal cellophane. 3M kicked off marketing for the tape on January 31, 1930. It soon entered the common household and became a popular method to fix simple damages, like torn paper and wee cracks. This early ’30s tin held 72-yard rolls of tape. Cellulose Tape is subject to weather variations. It is packed in tins for your protection.